Here in Thailand there is a kind of visa which requires that you leave the country once every three months, even if only for 5 minutes. 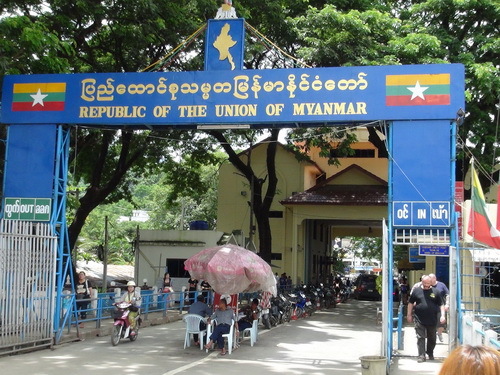 It’s called a non-immigrant visa, and like thousands of other foreigners I have to make a “visa run” to the Burmese border (The country is called Burma or Myanmar) to get my new stamp. It’s a fairly comfortable day trip in a “VIP” bus with only three seats across and a stewardess serving snacks and drinks (non alcoholic). The seats are really wide and they fold way down for sleeping. There is even a toilet on the bus. It’s a real luxury liner. For some reason the stewardesses in this particular bus company on this route seem to be mostly “lady boys”, as they are called in Thailand, or trans-sexuals. However nobody is raising an eyebrow. Sexual orientations which diverge from the norm are much more accepted in Thailand than in many other countries. So one day I was on my visa run, and next to me on the bus was a young woman in her early twenties. We struck up a conversation, and it turned out that we had a lot in common. We were both Americans. I had grown up in Germany and she had spent years in Germany. Both of us spoke fluent German and English. But that was not the end of it. We were both involved in internet marketing, and it turned out that we could work together on some projects of my business. But that was not the kicker yet. We found out that we had the same, not very common last name! I mean – how much coincidence is enough! 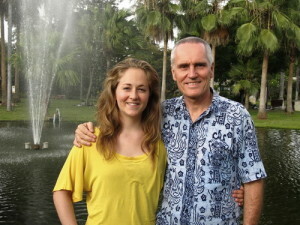 When we arrived at the Thai/Burmese border, we must have appeared like father and daughter. One of the vendors in Burma assumed that we were family indeed, and we played that role just for the fun of it. This event might not have been such a coincidence if we had met in the US or in Germany where there are at least more people with the last name of Kern. But what are the chances of such a coincidence – sitting next to each other in a bus in Thailand. We realized that with our identical nationality, identical language skills, and same last name we could have easily passed as father and daughter anywhere we went. It is amazing what can happen when you are traveling and just go with the flow. There is something about getting out and about, seeing new places, meeting new people and allowing adventures to happen. And last but not least, I found my calling in Thailand. I found meaningful work which allowed me to help thousands of people with their state of health and well being. 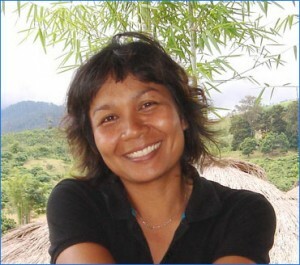 And with my founding of Thai Healing Massage Academy I could share my skills with students from all over the world. Not bad for a little Thailand trip, wouldn’t you think so? You never know what can happen when you get out there and invite serendipity and coincidences into your life!